"You see? —continued Mao— that's how to start a people's war; it's not hard. Do you want to make war? It's a question of making up your mind." on his arrival in Beijing in November of 1960. Beginning with the early careers of Marx and Engels, the refugee founding theoreticians of communism, solidarity networks played an important role in the movement of ideas and people within the world of international communism. Even before the Russian Revolution, communists and fellow travelers fleeing repression in one country could often expect aid from comrades in their country of refuge. The experience of the diasporic leadership of the Russian Revolution is instructive here. Lenin floated across Europe for most of the first two decades of the 20th century, and involved himself in the political disputes among his hosts when the opportunity arose and time permitted.3 Before the 1917 Russian Revolution, two organizations, the First and Second Internationals, were created to structure international cooperation between communist parties. The Soviet Union used its resources to create large bureaucracies and intricate structures to coordinate international communist activity. These organizations were intended to advance the cause of international revolution, to coordinate cooperation between the communist parties of the world and to project the influence of the socialist bloc within popular movements abroad. Soviet efforts to guide communist movements in other countries led to the remarkable situations wherein a German, Otto Braun, led the Chinese Communist Party for a time (1933-1935) and an Indian, M. N. Roy, played a leading role in the Mexican Socialist Party (1919). People and ideas circulated globally in the international network created by the Soviet Union. The 1956-1963 rupture between China and the Soviet Union reverberated throughout this international communist network.4 When the Chinese and Soviets concluded in 1963 that they could no longer co-exist within the same international structures, the Chinese encouraged their supporters to form separate communist parties. For the pro-Chinese communists and fellow travelers, the capital of world communism changed from Moscow to Beijing. In the period before the Chinese and Soviet parties sundered ties, both sides attempted to utilize the networks of international communism to win adherents. Moscow had the advantage in this contest, but these Soviet-dominated networks also played a crucial role in establishing China's influence in Latin America. To illustrate the different ways in which these networks operated to establish Chinese influence in Latin America, I've selected three separate individual experiences to examine below: a Bolivian communist functionary in Prague, a Mexican artist in Cuba and a Peruvian student in Paris. Oscar Zamora had been a student leader in Tarija, a provincial capital in southern Bolivia, in the 1950s. In 1960 Zamora took up a position on the secretariat of the International Union of Students (UIS) in Prague. The secretariat consisted of about thirty members, including representatives from each of the socialist countries and from a smattering of non-socialist countries. The UIS was the main vehicle through which the socialist bloc coordinated its international policies directed at students (it was something like a student version of the better known World Federation of Trade Unions).5 As the Sino-Soviet split erupted, Zamora attended a student conference in Albania that was set up in opposition to the UIS, and then traveled to China where he met with Mao Zedong and Zhou Enlai. Although Zamora had been absent from Bolivia for five years, he parlayed his international connections into a position as second in command of the new pro-Chinese Communist Party of Bolivia (Marxist-Leninist) (PCB(ML)) at its founding congress in April 1965. Renaming himself 'Comandante Rolando,' Zamora launched a brief guerrilla struggle beginning with a series of land seizures by landless and land poor peasants in late 1970. However, he was quickly caught by Bolivian armed forces. He had a sizeable collection of Maoist literature on hand when captured, but was carrying only two revolvers. Zamora was summarily sent into exile. When China's policies changed after Mao's death in 1976, Zamora maintained his connections to China and accepted China's new capitalist orientation during the 1980s. As a result, he went on to promote Chinese business interests in Bolivia and became Bolivian ambassador to China in 2000. While Zamora's story illustrates how the networks of the international communist movement facilitated the formation of new Maoist parties and guerrilla groups out of organizations that pre-dated the Sino-Soviet split, the story of the Mexican artist Andrea Gómez illustrates how non-party intellectuals were drawn to China through other networks created by international communism. Gómez had won national recognition in the 1950s for her linoleum prints "La niña de la basura" ("The Girl of the Garbage") and "Madre contra la guerra" ("Mother Against War"). In the early 1960s Gómez went to Cuba to paint murals. While there, she met the Chilean artist José Venturelli, who had already participated in art exhibitions in China in the 1950s. Venturelli infected Gómez with enthusiasm for visiting China, and passed along her request for an invitation to visit China to the Chinese embassy in Havana. Gómez visited China for two months. She mainly applied herself to learning Chinese artistic techniques, but she also toured the country and learned about the Chinese approach to socialism. Gómez was also invited to several banquets, including one hosted by Zhou Enlai for visiting Latin American intellectuals that was attended by the Uruguayan novelist and social critic Eduardo Galeano.7 While Latin American communist activists were in China at the same time as Gómez and Galeano, these banquets did not include communists who were receiving ideological and military training. Even while they gave material aid to pro-Chinese communist parties in Latin America, the People's Republic of China ran a parallel track of cultivating friendly relations with Latin American intellectuals who had no interest in submitting to the discipline of a communist party. However, as we see in Gómez's case, these tracks sometimes crossed. After her return from China, Gómez took up residence in Cuernavaca, south of Mexico City. Coincidentally, the Mexican Maoist leader Florencio Medrano led an effort to create an urban base area for a Maoist guerrilla war in Cuernavaca in 1973 by leading a land take-over on the outskirts of the city and establishing the self-governing squatter community Colonia Rubén Jaramillo on the seized land. Gómez took a plot in the colonia and painted a mural of Rubén Jaramillo, the veteran of Emiliano Zapata's army and namesake of the settlement. Her function in the community was that of an artist. She was not a party to the making of the details of Medrano's plans to wage guerrilla warfare based on the support of the squatter community. Eventually the army occupied the colonia and Medrano re-located to Oaxaca, where he later died in combat with the Mexican army. Gómez remained supportive, but had no concrete way to contribute to Medrano's movement after the army drove Medrano out of Cuernavaca. Gómez's experience in China and later incorporation into the Maoist movement in Mexico as a supportive artist illustrates how the networks of international communism that existed prior to the Sino-Soviet split facilitated the creation of pro-Chinese sentiment among intellectuals, which sometimes was translated into direct support for the efforts of Maoist political parties in Latin America itself. 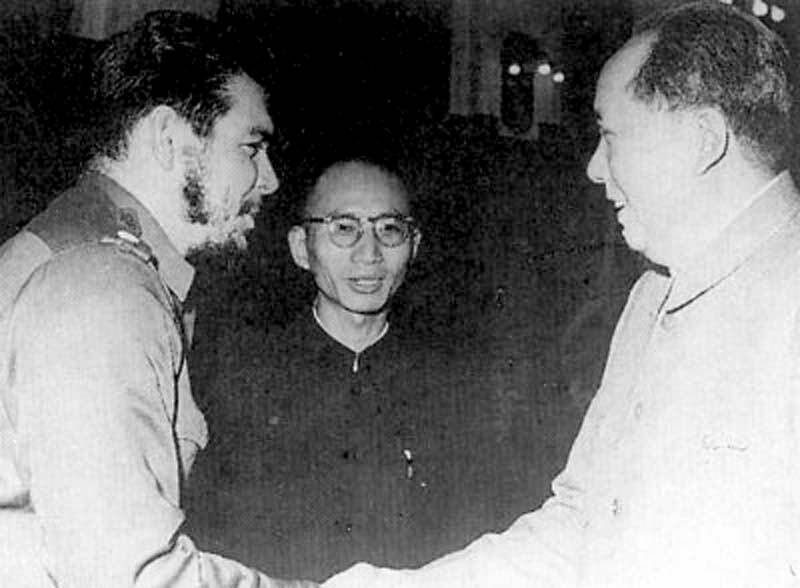 In particular, Cuba in the early 1960s was an international crossroads where pro-Chinese Latin American intellectuals could discuss their support for China with other intellectuals and could connect with China through the Chinese embassy. No Chinese embassy existed anywhere else in Latin America until Chile gave diplomatic recognition to the People's Republic of China in 1970. Our last example illustrates how the networks created by international Maoism could be influential even without direct Chinese participation. Elena Iparraguirre (today well-known in Peru by her nom de guerre, Comrade Miriam) was a 21-year-old student activist at Lima's La Cantuta University when she joined one of several Maoist factions of the Communist Party of Peru (PCP) in 1968. As her main party task, she worked with the People's Women's Movement (Movimiento Femenino Popular), an organization that the faction of the PCP that she belonged to created as a vehicle to organize women for revolutionary struggle. As a People's Women's Movement activist she was guided by Augusta la Torre, a Maoist cadre who had attended a cadre training course in China. In 1970, Iparraguirre fell in love and abandoned the party and her studies to go to live in Paris with her new husband. However, Paris was not a place for escaping Maoist influence in the early 1970s. In Paris she lived at a building that the International Red Cross maintained for political refugees, although many international students and other youth who were not refugees (like Iparraguirre) stayed there as well. The Chinese Revolution was in vogue in France at the time, and Colombian Maoist leaders were among the refugees staying at the Red Cross hostel where Iparraguirre lived.8 According to her own testimony, "the experience of the Chinese Revolution aroused me in Europe, it nourished me, and I didn't lose touch with the Party. "9 Rerouted to revolution by her experience in Paris, Iparraguirre returned to Peru in 1974 and joined the Communist Party of Peru (Shining Path), the party that her faction had formed in 1970. In 1979 she was recruited to the Party's central committee as it began its final preparations for launching the guerrilla war that would plunge Peru into a major crisis by the end of the 1980s. Iparraguirre quickly became one of the Shining Path's main leaders during the war. The war launched by the Shining Path in 1980 affected the lives of all Peruvians during its most intense years, approximately from 1985-1992, and at least 69,000 people died during the war. 10 It is remarkable to think that, had the Chinese Revolution not had the influence it did in France and on the various refugees that Iparraguirre lived among in Paris, she would not have returned to Peru to live for revolution. Yet within a decade of her 1974 return, she was a top level leader of the Shining Path, one of her main tasks being to train leaders at lower levels in the party's command structure. Our three examples show three different processes whereby the structures of international communism played key roles in the formation of Latin American communism. In our first case, these were the formal structures of international ties between communist parties and communist-aligned mass organizations. In our second case, the informal circulation of intellectuals within the countries of the socialist camp led the artist Andrea Gómez to her alignment with Maoist rebel forces in Mexico. In the final case, the international circulation of Maoist people and ideas helped to steer a wayward young student back into the communist fold. Given the importance of Maoist groups in the social and guerrilla movements of some Latin American countries in the 1960s, '70s and '80s, we can gain a new appreciation for the role of global connections on those movements by understanding the global circulation of supporters of Maoist China and Maoist ideas. Matthew D. Rothwell is Assistant Professor of History at the University of Southern Indiana. His recent publications include "La Influencia China en América Latina: Comparando el Perú y Bolivia" in the Septiembre, 2010 issue of Revista Fuentes (La Paz, Bolivia), and "Transpacific Solidarities: A Mexican Case Study on the Diffusion of Maoism in Latin America" in The Cold War in Asia: The Battle for Hearts and Minds, Zheng Yangwen, Hong Liu and Michael Szonyi, eds. (Brill, 2010). He can be contacted at mdrothwell@usi.edu. 1 José Sotomayor Pérez, ¿Leninismo o maoísmo? (Lima: Editorial Universo, 1979), 24. "¿Ya ven? —prosiguió Mao— así se puede comenzar una guerra popular; no es difícil. ¿Quieren ustedes hacer la guerra? Es cuestión de decidirse." 2 The second phenomenon requires lengthier discussion, and is the subject of a work in progress. 3 See, for example, Lenin's "Tasks of the Left Zimmerwaldists in the Swiss Social-Democratic Party" in V. I. Lenin, Collected Works (Moscow: Progress Publishers, 1964), Vol. 23, 137-148. 4 On the Sino-Soviet split, see Lorenz M. Lüthi, The Sino-Soviet Split: Cold War in the Communist World (Princeton: Princeton University Press, 2008). 5 Interview with Oscar Zamora in Sucre on March 20, 2007. 6 Interview with Oscar Zamora in Sucre on March 20, 2007; Interview with Jorge Echazú Alvarado in La Paz on February 23, 2007; Interview with Diva Arratia del Río in La Paz on March 1, 2007; Interview with Hugo Borda in La Paz on March 11, 2007; Interview with Víctor Reinaga in La Paz on March 13, 2007. 7 Galeano's most famous work is Open Veins of Latin America: Five Centuries of the Pillage of a Continent, trans. Cedric Belfrage (New York: Monthly Review Press, 1973). A more recent work that may be of interest to readers is Upside Down: A Primer for the Looking-Glass World, trans. Mark Fried (New York: Picador, 2000). 8 Those wanting to get a sense of the French vogue for the Chinese Revolution, or to communicate it to a classroom, could start worse places than Jean-Luc Godard's 1967 film, La Chinoise (1967). 9 Comisión de la Verdad y la Reconciliación (CVR) interview with Elena Iparraguirre in Callao on March 12, 2003, 8. The Colombian identity of the Maoist leaders who stayed where Iparraguirre did is audible on the recording of the interview, although it does not appear in the official transcription. Other biographical data on Iparraguirre used here is taken from this interview. 10 Comisión de la Verdad y la Reconciliación, Informe final (Lima: Defensoría del Pueblo, 2003), 13.